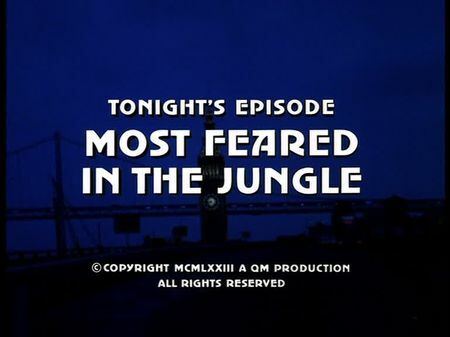 I have just added the screencaps for Most Feared In The Jungle to the episodes' page. Barbara Talmadge, a young and pregnant single woman, is taken to a small hospital for delivery. After waking up again, she finds herself alone in the streets missing her baby and with no real orientation. She returns to the 'New Choice House', home for unwed mothers, where she has accomodation. When she starts to ask questions, Mrs. Davenport, the home's director, tells her that her baby was stillborn and she is suffering kind of a trauma. Barbara still thinks her baby is alive and was kidnapped, and following a fight in which Mrs. Davenport accidently dies, homicide is taking over whereas Barbara embarks on a murderous quest to find her baby. As Mike and Steve soon find out, a broken relationship to her elitist mother does not make things easier for Barbara, so they need to hurry in order to track down the ring of illegal adoptions involving the unwed mothers' home, a private investigator, and a former physician who had lost his licence years ago. Actually, most of this episode's locations can be found between Pacific Heights and the Lower Haight. The delivery hospital (the same building, by the way, was used as filming location in the preceding episode, Winterkill), and private investigator Matthew Starr’s bureau (with the rooftop chase) are located adjacent to Lafayette Park. The doctor's office of Dr. Hyland jun. is on Van Ness Avenue, and the unwed mothers' home named 'New Choice House' can be found on Page Street in the Lower Haight. Mike and Steve are called soon after leaving famous 'Mama's at Washington Square' in North Beach, and the motorcycle police officer is shot by Barbara at the triangle of Marina Boulevard with Avila Street and Casa Way. Also included are Tiburon (house of Dr. Hyland sen.), Daly City (house of the Hunt couple), as well as San Francisco City Hall for the final sequence. As a sidenote, and for the first time in the series, the screenplay refers to an earlier episode of the second season, The Victims. Mike asks Steve about his relationship to Connie (the female journalist) and Steve tells him that they finally split up since she was not able to deal with his work.